Posture Support for a Slingback Wheelchair. A patient eligible for a manual wheelchair or some power wheelchairs under Medicare is automatically eligible for a basic back. The Easy Clip Back provides more firm back support and is simple to install and remove. Weight 50017 2.5 lbs., 50018 3.3 lbs., 50019 3.8 lbs. 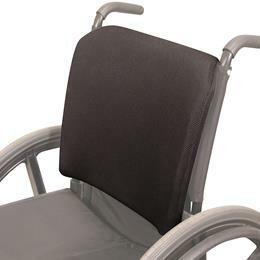 Materials Foam back and lumbar support over molded contoured ABS base, removable washable cover.